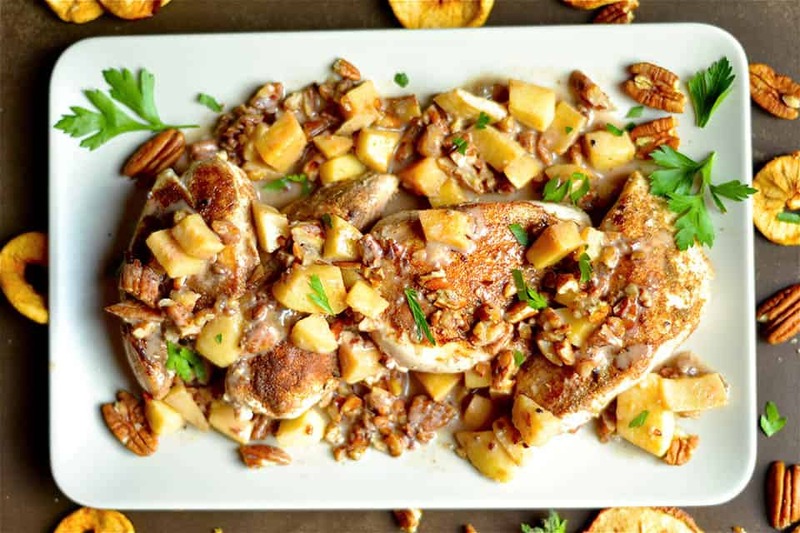 This yummy fall dish combines spiced chicken with a creamy toasted apple pecan sauce that the whole family will love! Only 1 pan, and 20 minutes is all you need for this simple weeknight dinner! Apples, apples, apples, and more apples. Oh how I love fall!! 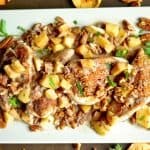 Recently I bought a huge crate of organic honey crisp apples at my local farmer’s market, and have been creating new ways to cook with them, or just add them to anything. Salads, breakfasts, side dishes and now dinner. 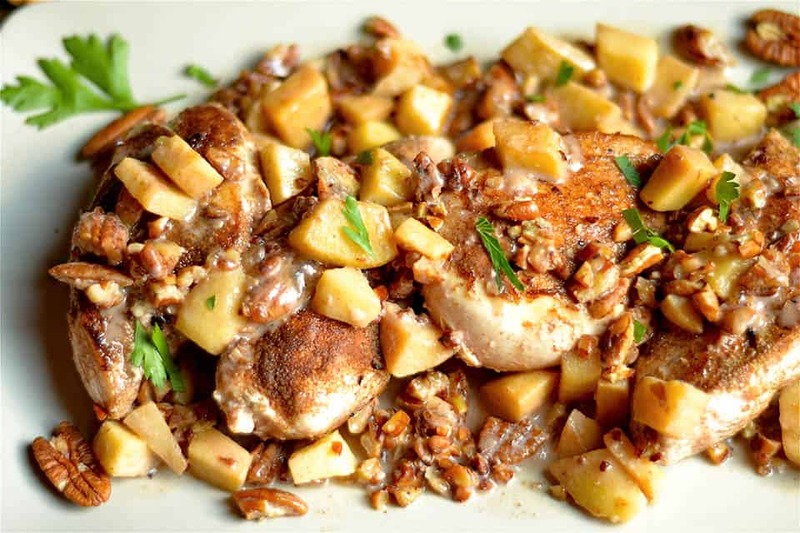 Apples are so versatile to provide that depth, texture, and taste to any fall dinner. 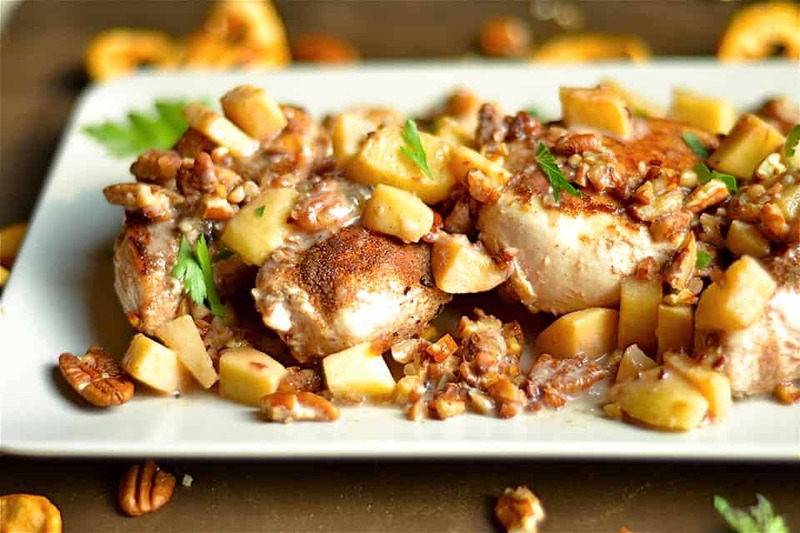 Combining it with pecans is a winner winner, chicken dinner!! 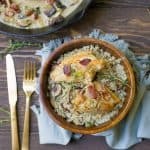 This savory & sweet chicken dinner is sure to be a hit with everyone, and is even elegant enough to serve to company. I also love that this dish only requires ONE PAN. All the components are cooked in the same skillet. Making this dinner come together in about 20 minutes. I started off by combining a few spices together for a rub on the chicken while heating up my skillet. These spices are a blend of cumin, cinnamon, cardamom, and salt. Such a delicious compliment to the apples! You will sear the chicken on each side for a few minutes. It doesn’t necessarily have to cook all the way because you’ll throw it in the pan a bit later. Once the chicken is seared, set aside and cover with foil. 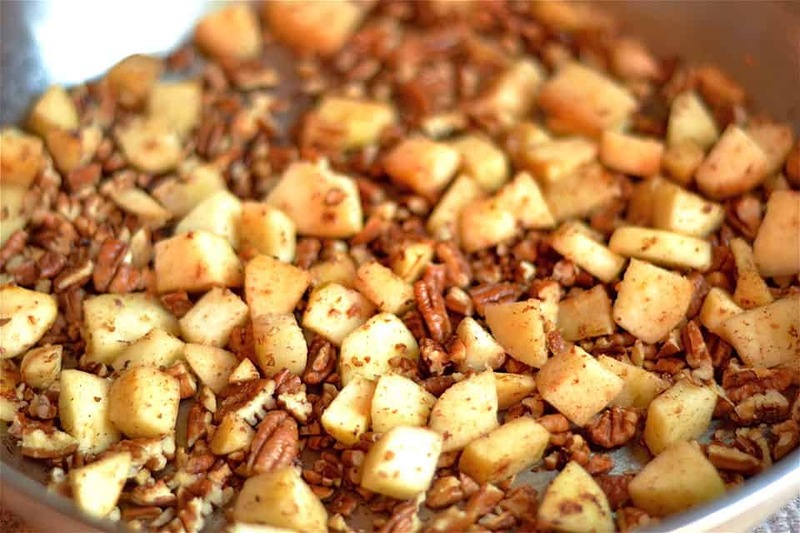 Add the chopped pecans, apples, and crushed garlic. This mixture will cook for about 3-4 minutes, stirring frequently and gathering up bits of the spices. Now add in the creamy part. I used coconut milk here as part of a dairy-free diet, but if that is not a requirement, feel free to use half and half or heavy cream. Continue to scrape the bottom of the pan for the bits and spices. Add the chicken back to the pan and cook completely for another 5 minutes. Many options for a side dish here! My kids and hubby enjoyed their chicken on top of rice, I enjoyed mine with spaghetti squash. I also served with a side salad and my NEW FAVORITE fall dressing: Toasted Pecan Vinaigrette. It was a delicious saturday night dinner at home! Pour in coconut milk, apple cider vinegar, and scrape the bottom of the pan to flavor the sauce. Add Chicken back to the skillet. Cover with a lid and let the mixture cook for another 3-5 minutes, or until the mixture is thickened and chicken is cooked through. Add an additional pinch of salt, or more to taste. Serve immediately over rice, greens, or vegetable noodles. *If not following a dairy-free diet, you can substitute coconut milk with half and half. 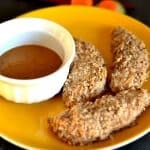 Do you have nutritional information for this recipe? My fitness pal is telling me it’s 530cal per serving, but that seems really high! Hi Madalyn, when I inputed the recipe to my calculator it came out to 440 calories. The pecans and coconut milk add more calories, you can easily cut those ingredients by a bit to come out below 400. However, I am a HUGE fan of adding those quality fats to the diet and would recommend for nutrition purposes and flavor to keep those ingredients . Hope that helps! This looks really yummy! I was thinking about making this recipe with my weekly meal prep, how do you think it would hold up as leftovers? I’m planning on putting it on greens for a big salad! This was so great, and very quick and easy to come together with what I had in the fridge/freezer! I added a little chopped frozen kale and a splash of apple cider vinegar and served with cauliflower rice. Thanks for the great recipe! What could you substitute for the arrowroot starch? Almond flour? I just made this for my family for tonight’s Sunday dinner and it was a major hit! My husband is sometimes a timid eater when trying new things and he liked it, a lot. Great recipe! 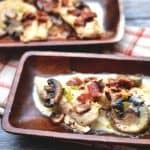 I made this recipe and my husband and I both loved it. Added butternut squash noodles. Will make this again for friends. This was sooooo delicious! We served it over spaghetti squash. It would be amazing over a sweet potato also! Thank you for the great recipe! Do you have a calorie count for this? 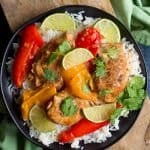 Could you substitute the coconut milk for something else? I am allergic to coconut! thank you! Can you have dairy? You could try half and half. Otherwise leave out the coconut milk entirely!